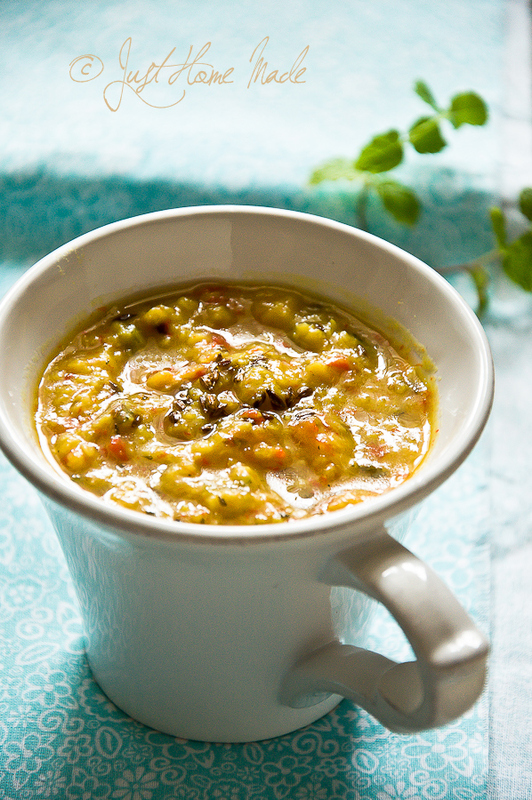 When all one needs is a pot full of warm sunshine comfort, yellow lentils are a must. 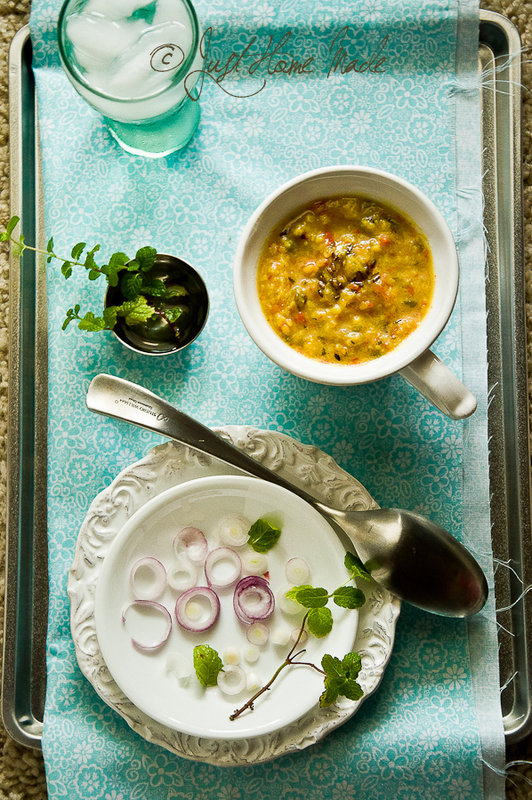 Moong Dal or Split Yellow lentils are one of the most frequently used lentils in our house. I like it for its lightness, faint sweetness and also its cooling properties. Because it is so non-fussy and cooks in little time, it is by default a weekday favorite too.. Combine it with any veggies and it comes out delicious in any combination. No doubt it is our favorite. And it was also the first lentil in cooked form, my little girl was introduced to when she started taking in her first solids. It makes for such a great baby food combined with some carrots or peas. Shahi Jeera or Royal Cumin Seeds are slightly longer, darker and a tad bit sweeter than regular cumin/jeera seeds. While it is more commonly used in Biryani and Tandoor dishes, it adds a special oomph to a simple dal such as this. Red bell pepper flavors intensify when roasted. I’d love to try with roasted red bell peppers at another time..
Is there a lentil you call your favorite? Tell me how you like to cook it..
Wash and pressure cook lentils with diced red bell pepper, tomatoes, onion and a pinch of turmeric for 3 cooker whistles and keep aside to cool. Alternatively, cook on stove top until lentils are soft and are mashed easily. When the cooker has cooled, whisk the cooked lentils for them to blend well. Place oil in a medium pot over high heat. When the oil is hot enough, add shahi jeera or cumin seeds. When they start to sizzle, reduce the heat to medium-high and add sliced spring onion/green garlic followed by grated ginger and sauté until translucent or light brown. Pour in the mashed lentils over this tempering onto the sides, carefully avoiding the sizzling oil and rising steam. Add red chilli powder, salt and give it a good stir. Add more water if needed or if the dal is very thick. Bring it to a boil and simmer for a few mins stirring in between to avoid the lentils from burning at the bottom. 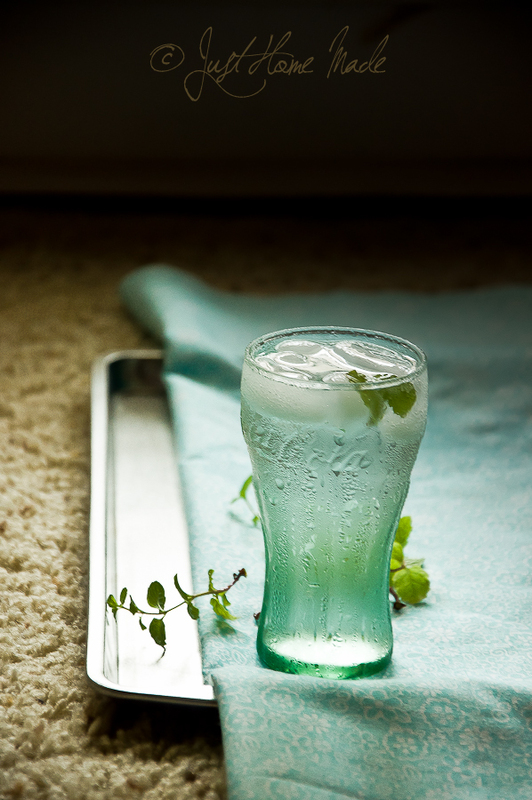 Finish by sprinkling dried or fresh mint and lemon juice. 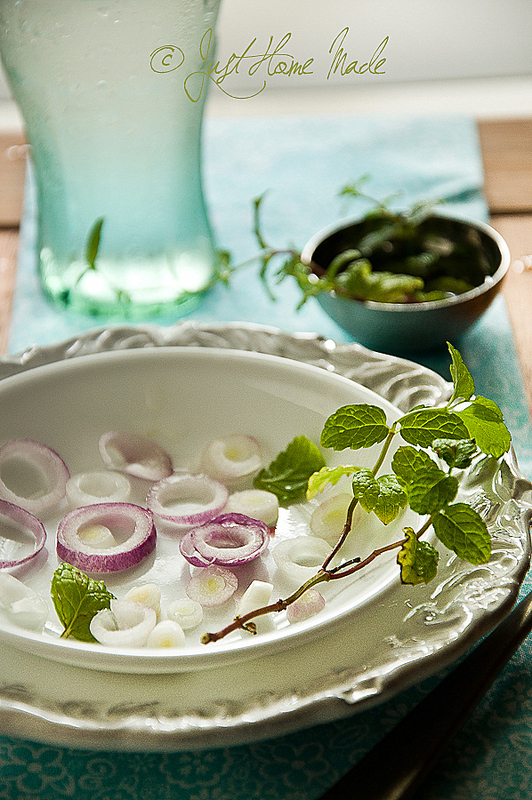 Stir well and serve hot with brown rice or chapati/roti. For a deeper flavor, roast the lentils before pressure cooking, either on stove top over low flame until golden brown and fragrant or microwave for 2 mins in 30 sec intervals on a microwave safe plate. Lentils are always a comfort and there are so many different way I like it. Just yesterday I made pudina daal 🙂 One of my fav form is just boiled daal tampered with ghee, cumin, hing and curry leaves. Quick and delicious. This sounds delicious and your photography is lovely. It’s such a good suggestion to use a pressure cooker for the lentils rather than waiting around for hours for them to soften. Welcome to Just Homemade! Happy to know you find it lovely here.. If you plan on including lentils and beans seriously into your diet, a pressure cooker will be an invaluable add to your kitchen. It is a utensil of choice in most Indian kitchens..
LOVE daal! Can’t wait to try this one. My favorite is usually red lentils, mainly because they cook quickly. Always with cumin though–my favorite spice! Oh, I do! But for a weeknight I’ll usually grab the red. I have a lovely selection of lentils, but this recipe will give me a great excuse for the yellow ones to get some love! Still to try yellow moong dal,.bowl looks yum,. I hope you get to try once.. This sounds delicious and nutritious! Can’t wait to try! Love dal. All the time!! That’s a great recipe using bell pepper and mint! This has happened before many times with other bloggers for several of my props.. Guess we have a similar taste then! I do that way too most of the times Chin.. way of convenience! Great shot! I love how u have dressed up the food with a colorful prop and made it more appetizing! Lovely pics Radhika!!! I love dal and am always on a lookout for new ways to make it. This sounds fabulous!! An interesting take on dal, I have not had it with lentils so this is something I must cook soon. Beautiful photographs! Me again 🙂 Just wanted to stop by and tell you that I made your recipe last night. Hubby and I loved! He suggested I make it again very soon, will do. Thanks again for sharing. It’s always fun to play around lentils because it can be cooked many different ways, not to mention, it has many health benefits like helping in lowering cholesterol and stabilizing blood sugar. I like your recipe. Would love to try cooking this one, too. Thanks for the recipe! It was delicous! !